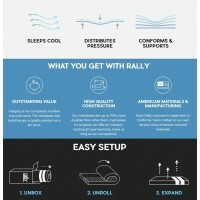 RALLY HYBRID IS A COMBINATION INNERSPRING AND MEMORY FOAM MATTRESS WITH YOUR CHOICE OF PERFORMANCE COOLING COVER OR STANDARD COVER. RALLY COMES COMPRESSED AND BOXED FOR EASY HANDLING AND SHIPPING DIRECT TO YOUR HOME. SHIPPING IS INCLUDED IN THE PRICE AND RALLY COMES WITH A 100 NIGHT SLEEP TRIAL WITH FREE RETURNS. 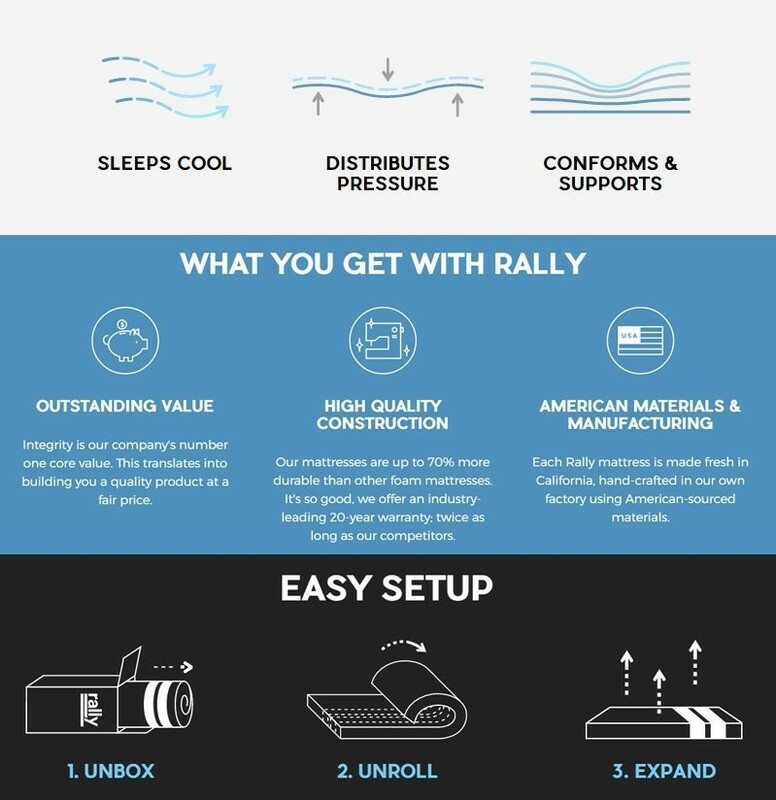 RALLY HYBRID SLEEPS COOL - BY USING A COMBINATION OF ADVANCED, CONDUCTIVE MATERIALS, VENTILATION AND OPEN CELL DESIGN, RALLY ACTIVELY MOVES HEAT AWAY FROM THE BODY AND OUT THE MATTRESS. RALLY IS MADE FROM CERTI-PUR CERTIFIED FOAMS, MEANING THEY ARE MADE WITHOUT OZONE DEPLETERS, PBDE FLAME RETARDANTS, FORMALDEHYDE, PHTHALATES, MERCURY, LEAD AND OTHER HEAVY METALS. 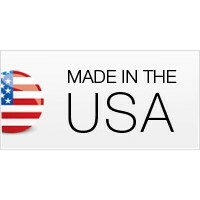 SUPERIOR CONSTRUCTION - DIAMOND MATTRESSES ARE KNOWN IN THE INDUSTRY TO BE 70% MORE DURABLE THAN OTHER FOAM MATTRESSES, AND ARE BACKED BY AN INDUSTRY-LEADING 20-YEAR WARRANTY. 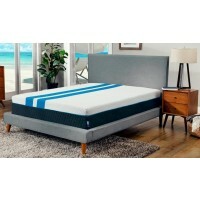 DIAMOND MATTRESS IS A 70 YEAR OLD COMPANY, FOURTH-GENERATION FAMILY-OWNED AND LOCATED IN THE USA. RALLY PERFORMANCE FABRIC - COOLRELEASE TECHNOLOGY BREATHES AND WICKS AWAY MOISTURE TO CREATE A COMFORTABLE, COOL DRY AND REJUVENATING SLEEP SURFACE. 2" COPPER GEL FOAM LAYER - VENTILATED FOAM LAYER INFUSED WITH COPPER GEL PROVIDES THERMAL CONDUCTIVITY, ACTIVELY MOVING HEAT AWAY FROM THE BODY. 2" GEL MEMORY FOAM - RESPONSIVE GEL MEMORY FOAM PROVIDES A PERSONAL & CONFORMING FIT WITHOUT CREATING THAT SUNK-IN FEELING THAT MOST NAME BRAND MEMORY FOAM MATTRESSES CREATE. 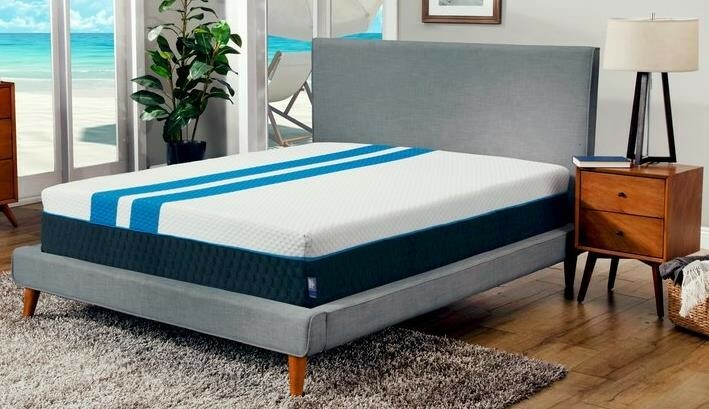 2" HD FOAM - A LAYER OF SUPER-DENSE ORTHOPEDIC FOAM ENHANCES THE BUOYANT, WEIGHTLESS FEEL OF THE MATTRESS AND GIVES YOUR BODY THE SUPPORT IT NEEDS FOR PROPER SPINAL ALIGNMENT SO YOUR MUSCLES CAN FULLY RELAX, REST AND REJUVENATE. 6" POCKETED COIL INNERSPRING SYSTEM - SUPPORTIVE INDIVIDUALLY WRAPPED COILS PROVIDE THE ULTIMATE IN UNDISTURBED SLEEP ALSO HELPING MAINTAIN HEALTHY SPINAL ALIGNMENT.